In the previous article: A tale on highway hawking,we saw that highway hawking indeed has a devastating effects on the hawkers themselves. Series of reports on death resulting from this type of business have been counted,adding further reason why many states government in Nigeria, place a ban on highway hawking business. Here on this issue,we are going to see the various ways we can stop highway hawking in our society. One of the most effective ways to make laws stand is enforcement. Yes,we mean that if the government truly want to end the highway hawking,they just have to do so through their law enforcement agencies. The police force was created to serve this purpose. Again as individuals,we can also stop highway hawking in society by discouraging the hawkers from engaging in this method of doing business. 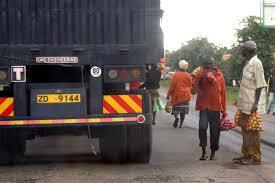 There are two ways we can discourage hawkers from hawking on the highways. One of the ways is :enlightenment and thee other is by refusing to patronize them. Enlightenment: This is a platform that has provided an opportunity to have one on one talk with the highway hawkers. On this platform, you could reach the heart of the hawkers by clearly showing them the dangers in highway hawking. Make them see your points and conviction. Help them make the decision on their own to choose any setting where they can still do the same business,order than on highways. The second way we can stop highway hawking is by refusing to patronize them..Of course when you and I determine not to buy anything the highway hawkers sell on a highway,we would be sending them either to the street or down the market to sell their goods. A lot of people buy things from highway hawkers because of pity. Many times they just want to buy from them in order to relieve them of their loads and made it light for them. But my dear friend,buying things from highway hawkers is not a way to show them pity. In fact,they do not need any pity to survive. They need discouragement to get them out of the highway,and send them to better places,thereby,saving their lives,and making them better humans!! !